It's currently over 100 F where I live and I'm trying not to melt. I've been staying cool eating lots of fruit and making iced coffees. My cats are combating the heat by sleeping in the tub. I am longing for jeans and sweaters weather! Over the weekend I started a printmaking project. 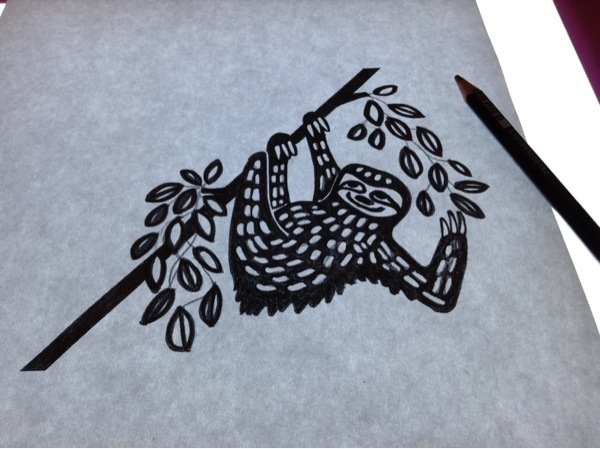 I'm carving out a Lino block using one of my new sloth drawings. At first I tried using the traditional Lino block but found it too difficult and time consuming to cut. Then I switched to Speedball's Speedy Carve block and it cuts like butter. Yay! You can see now I'm almost done cutting out the sloth. Before cutting I first had to transfer my drawing to the block by drawing over the reverse image in pencil then burnishing it with a bone folder to the block itself. The Speedy Carve block also picked up the drawing better than the first block. Speedy Carve seems to be a winner so far. I have also been working on new cards for Paper Loop. The proofs just arrived and I'm looking over the final colors today! I have also spent some time updating the Paper Loop catalog with a new look and easy to read layout. I've been updating the collection for the wholesale site and catalog. These things take time so it's nice to feel like I've made some progress. I'm also making progress on my latest watercolor painting. Over the weekend I added a third layer of paint. I'm excited to see it all coming along. We also had fun making homemade pizzas. Yum!